Environmental Thoughts - Rochester, NY: Why are we demanding that Climate Change messengers make the math work for renewable energy scalability? Why are we demanding that Climate Change messengers make the math work for renewable energy scalability? Is it the job of environmentalists, renewable energy companies, and scientists to prove that renewable energy is scalable (able to replace the amount of energy we desire) now? It appears as though it is when Climate Change discussions focus on whether renewable energy is ready to fully substitute for the current energy of choice. 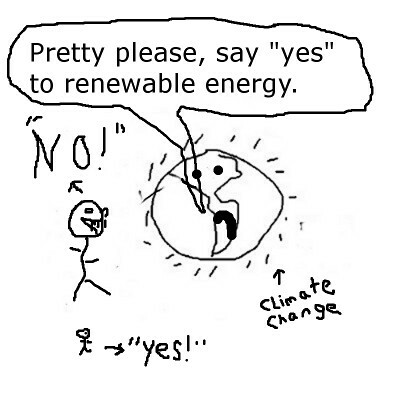 Environmentalist find themselves in the absurd position of having to prove -- to the public, to the media, and (even more absurdly) to economists -- that existing renewable energy options and costs can compete with fossil fuels in order to replace our dependence on fossil fuels. 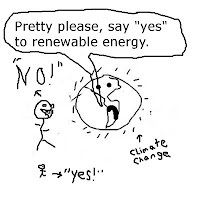 Many environmental groups, in their heroic attempts to appear optimistic and hopeful about a situation that becomes more dire each day, have in effect promised that humanity can shift quickly to clean, renewable energy options (yes, I’ve been doing this myself). But is it appropriate or even useful to place responsibility for proving this extraordinary claim on the folks explaining the threats of Climate Change, instead of on the very individuals and institutions whose job it is to make our energy options doable and sustainable. In fact, those pushing for rise of renewable energy and the fall of fossil fuels are doing a superb job at making the case that renewable energy is scalable, fair, and they are even advocating policies to help workers with the transition from bad energy to good. But the conversation about addressing Climate Change continues to be hijacked by scalability and costs and jobs, which are always couched as “gotcha” issues. This allows the public the dangerous delusion that there is an option when there isn’t (suggesting that we can do something else if renewables aren’t scalable). Continuing to burn fossil fuels will perilously warm our planet, period. There’s no either or. Isn’t it enough to make the case that renewable energy won’t warm the planet beyond dangerous limits, whereas continuing our addiction on fossil fuels will? Climate deniers get quite smug about demonstrating to environmentalists, the public, and the media that renewable energy just isn’t up to snuff on providing for our energy needs. They have more facts to back up their position than you can shake a stick at. But think about this: Shouldn’t it be the job of our economists and politicians to either show how our present economic system is capable of enabling renewables to provide for our energy needs, or else show us an alternative economic system that is? Isn’t it the job of the economists, the engineers, the politicians to make renewable energy work on a scale that will matter? Think about this too: What if environmentalists and renewable energy companies fail to make the case that renewable energy as it exists right now is scalable, is able meet our present and future energy demands? If environmentalists and renewable energy companies cannot provide all the energy we want to do whatever we want, despite the proof that manmade Climate Change will bring our life support system to a screaming halt, does that mean we should continue business as usual and destroy human civilization? Much of the heavy lifting at the COP21 Paris Climate Summit will be shaping a worldwide structure for an energy option that won’t threaten our existence. The net effect of those opposing renewable energy will be a few more years of profitability and then a quick collapse as the economics of stranded assets and biophysics overcome our ability to adapt. Historically we have treated environmentalist as the complainers along the way to our development of a super species. Because we have put the burden of proof of environmental damage on the victims, we’ve created the absurd stance that only a relatively small group of people need our environment. Environmentalists cannot save the world, while the rest go out and shop. We’re too few. All we can really do is ask that the rest of humanity focus on the priority of a life support system that supports us all. If we don’t quickly change the Climate Change discussion so that humanity accepts responsibility for this worldwide crisis, we will perish. Sunday, November 29, 2015- A coalition of concerned nonprofit organizations, churches, and businesses will march through downtown, to coincide with rallies, marches and other actions world-wide. The march is geared to urge leaders at the 21st United Nations Conference on Climate Change to achieve a legally binding and universal agreement on climate, from all the nations of the world. Supporters are scheduled to meet at The Episcopal Church of St. Luke & St. Simon Cyrene (Two Saints), 17 Fitzhugh St S, Rochester, NY 14614 at 1 p.m. Bishop Prince Singh, Imam Mohammed Shafiq, Norman Jones, Commissioner of Environmental Services, and Mary Lupien of Mothers Out Front, will speak briefly before the march starts. Organizers will lead the march to several locations in downtown Rochester relevant to climate change. By around 2 p.m. the marchers will return to Two Saints for more fellowship and music by the Mt. Hope World Singers and the Dady Brothers. Information will be available on ways to remain involved and on upcoming programs. WHEN: Sunday, November 29, 2015 at 1 p.m.
WHERE: The Episcopal Church of St. Luke & St. Simon Cyrene, 17 Fitzhugh St.
WHY: To urge action from leaders at the 21st United Nations Conference on Climate Change and to raise awareness throughout the Rochester community.